Over the weekend, an entire venue of Super Smash Bros. competitors and spectators lost their collective minds over the actions of one Jigglypuff player. Did he cheat in some way? Go overboard after a win? Destroy a CRT? Yell obscenities at the audience? No, he simply played to the Pokémon’s strengths in a favorable matchup, causing his opponent to get so frustrated that he unplugged his controller and left in a huff. Fighting games are all about matchups. Since characters often differ from one another in terms of move lists and play styles, competition can sometimes begin right at the character select screen. In Street Fighter, for instance, Dhalsim is almost always going to have an advantage over Zangief due to the way he can control space with his stretchy limbs. Super Smash Bros. Melee has a similar matchup in Jigglypuff vs. Ice Climbers, in which the floaty Pokémon is able to run away as soon as she gets a life lead, thereby keeping distance between herself and the duo’s scary mixups and grabs. This exact scenario played out at Battle of BC 3 in Vancouver, Canada this past weekend. As the event’s Super Smash Bros. Melee tournament reached the finals, Alejandro “Chango” Gastelum played to Jigglypuff’s strengths in a match against Ice Climbers main Chaucer “Fauxhebro” Gilson, using Puff’s hit-and-run gameplay to keep his opponent at bay. Fauxhebro, wearing a custom shirt emblazoned with #FreeFaux to protest the tournament’s banning of the Ice Climbers’ controversial wobbling technique, fought back admirably and ended up forcing a crucial fifth game to decide who would remain in the tournament. Throughout that fight, though, he looked frustrated. In previous games, Fauxhebro regularly shook his head in apparent disapproval of Chango’s tactics, and as he entered the final game of the match, he changed his in-game name to ‘PLAY’ as a way to signal his criticism of Chango’s keep-away game. When Chango continued to play defensively, Fauxhebro’s barely-contained irritation boiled over. Five minutes into the game, Chango held a slight 3-2 stock advantage thanks to his ability to float from platform to platform and avoid Fauxhebro’s Ice Climbers assault. Unable to make any headway, Fauxhebro simply stopped moving. Chango, due his life lead, had zero reason to approach an opponent that excelled in close-quarters combat, and waited at the opposite end of the stage, leading to a standstill. The commentary team complained. The audience complained. A fellow Super Smash Bros. Melee player, Johnny “S2J” Kim, held up two middle fingers in the front row to protest the Jigglypuff-fueled inaction on stage. Everyone booed, even the commentators. But in spite of all this, Chango sat stone-faced, refusing to engage until Fauxhebro finally unplugged his controller and walked off stage. The above video immediately caused divisions in the greater fighting game community on social media, split along predictable lines. Classic fighting game players saw nothing wrong with Chango’s play, comparing it to Justin Wong’s famous ability to play “lame” or “turtle” through many of his matches. The Smash scene, however, has a very different idea of what constitutes legitimate play. Due to the way characters like Fox and Falco have dominated tournaments, the community believes fast, combo-heavy matches should form the basis of competition. Anything else is disrespectful to those watching the fight, or so a vocal contingent of the scene seems to believe. Tactics like those that Chango put on display over the weekend are colloquially known as “camping,” a derogatory term for playing keep-away when there is no reason to approach. For my part, I find it hard to disagree with traditional fighting game players. Chango played the match beautifully, and forcing your opponent to get up and leave the set using just your gameplay to frustrate them should be a point of pride. At the Evolution Championship Series, I’ve seen audiences separate into similar camps. Folks who focus on games like Street Fighter, Tekken, and Guilty Gear will frequently cheer for Smash champion Juan “Hungrybox” Debiedma’s stalling Jigglypuff strategy, while Melee players boo for the exact same reason. What is considered exciting or engaging differs from game to game, due in part to the overall scene being more like a loose umbrella of feudal states rather than a unified community. While the Smash community has been embroiled in the ongoing wobbling discussion, a separate, less popular conversation has sprung up about the possibility of limiting the ways in which Jigglypuff can camp, with some players even wanting to ban her from competition altogether. These arguments typically revolve around how Super Smash Bros. Melee is perceived by viewers, with some worried that Jigglypuff matches are slow enough that they can turn people off from the game entirely. With Super Smash Bros. Ultimate gaining traction as the new hotness, this anxiety isn’t necessarily unfounded, but it also highlights the differing values of the Smash community in general, where playing to the growing spectator class is sometimes considered more important than allowing competitors to use whatever tactics they need to ensure a win, even if those tactics aren’t that exciting to watch. “I’ve got a lot to say about wobbling and the whole situation that went down today but all I’ll say is I miss the days when people honored the unwritten rules of Melee and didn’t cry about everything they didn’t understand,” Fauxhebro posted on Twitter after the tournament ended, seemingly referring to the scene’s tendency to shun defensive play. It’s hard to say whether wobbling would have allowed Fauxhebro to compete with Chango on more even footing, but there’s certainly a tinge of irony in protesting your character’s most potent technique being banned while also making a grand show of quitting against an opponent who is playing their character as efficiently as possible. 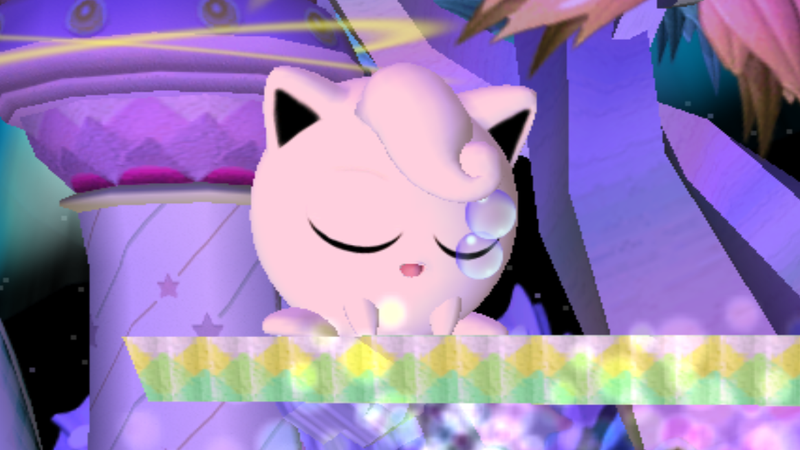 Much like with wobbling, the Jigglypuff conversation is one that won’t be going away for a while, and for better or worse, the Smash community will need to contend with it if they plan to continue supporting this unchanging, 17-year-old game.